Ahhh… As a paint geek, this is my favorite time of the year when all the paint manufacturer’s start announcing their annual “Colors of the Year”. The first one out of the gate is always PPG and this morning they just announced yesterday that the PPG 2019 Color of the Year is Night Watch (PPG 1145-7). 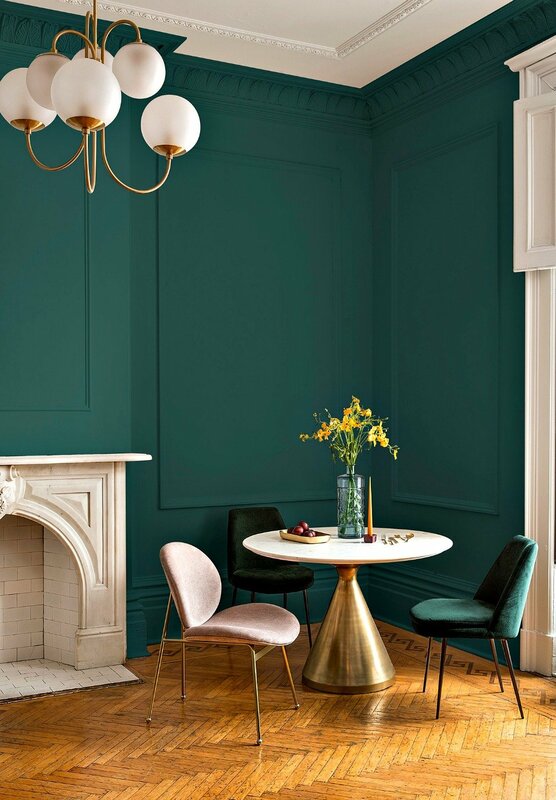 I am not surprised all at to see this rich deep color as their color pick as consumers have been trending towards more complex and deeper rich colors the last 12-18 months and I talked about seeing these trends last year when I shared the 2018 paint color forecasts. 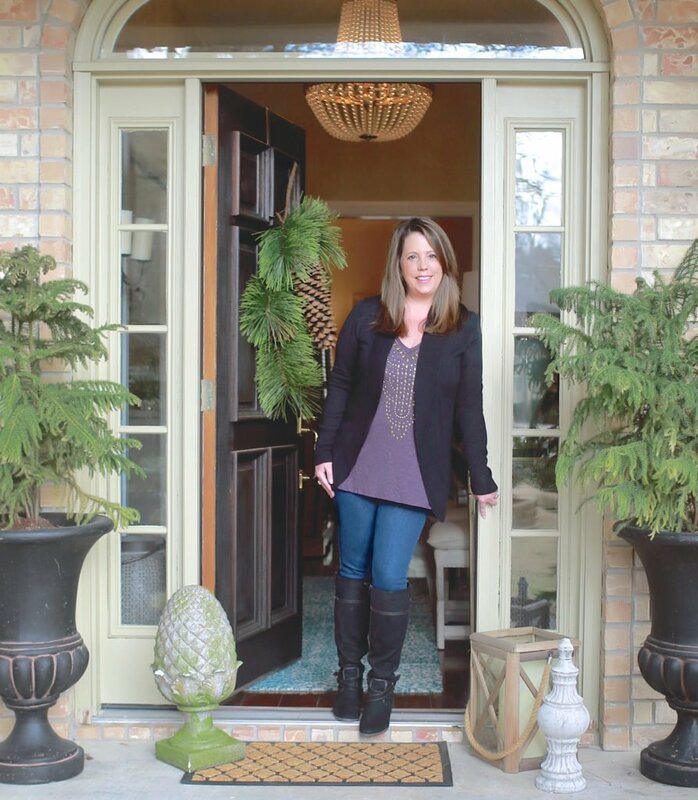 We’ve been seeing these deep colors used on accent walls, interior doors and cabinetry and I just love the trend, especially when the color is mixed with lighter colors and pastels. I also love Night Watch mixed with lighter wood tones and white trim, which helps balance these dark colors from overpowering a space. 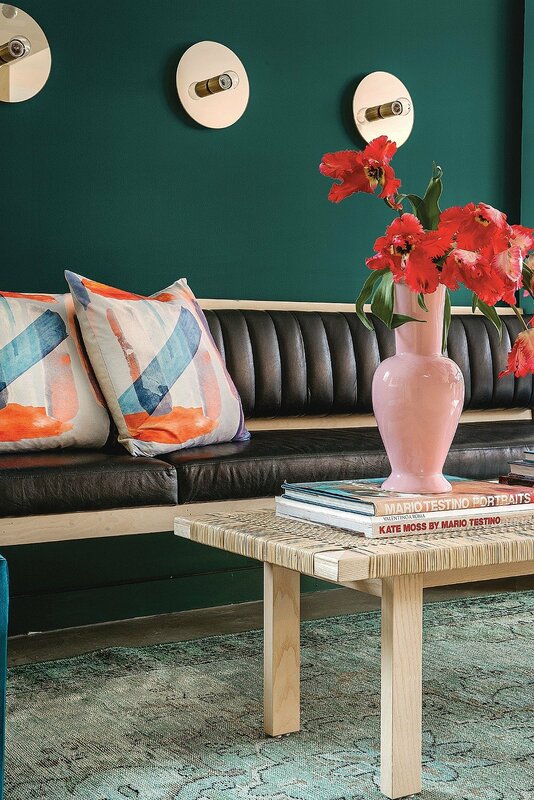 This deep green is a fantastic cabinetry color or used on a door. 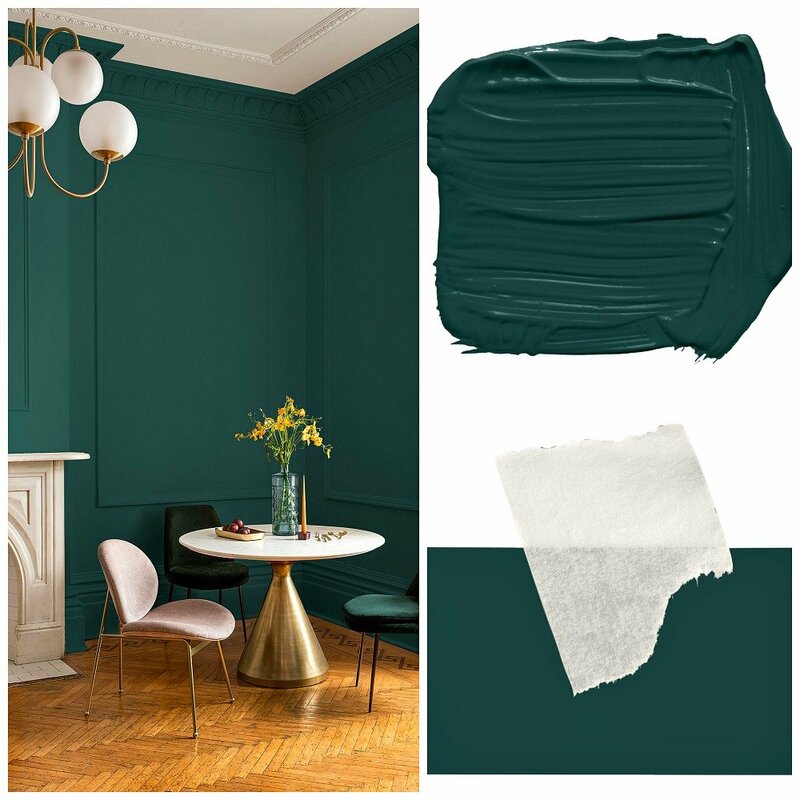 If you’re not ready to incorporate this color with paint, this is a trending color that we’re already seeing surging lately in home decor and fashion. I can’t wait to see the rest of the 2019 Colors of the Year that will all be coming out over the next 6-8 weeks and my money is that we will be seeing more of these rich deep toned colors dominate as we head into 2019. In fact, my prediction is we will be seeing some deep shades of burgundy, egg plant and chestnuts. If you missed all of the Colors of the Year for 2018, you can find those here. Love night watch color. Where can I purchase #4 the rug? What’s your opinion of using this with a grey sofa? Certainly need a cohesive look. I can’t say I’m wildly excited about this colour. Reminds me of the 9o’s when everyone had walls this colour. But I do like it in small doses, likes pillows and such. 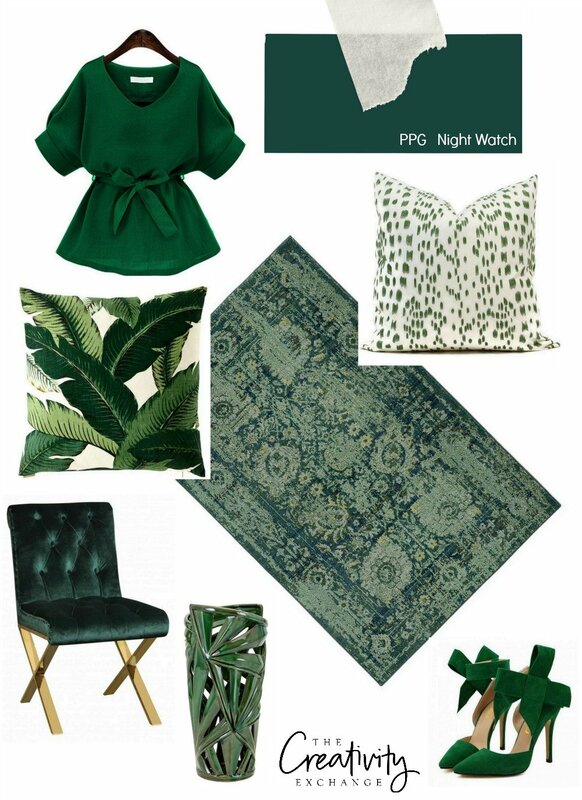 Interesting choice as colour of the year. 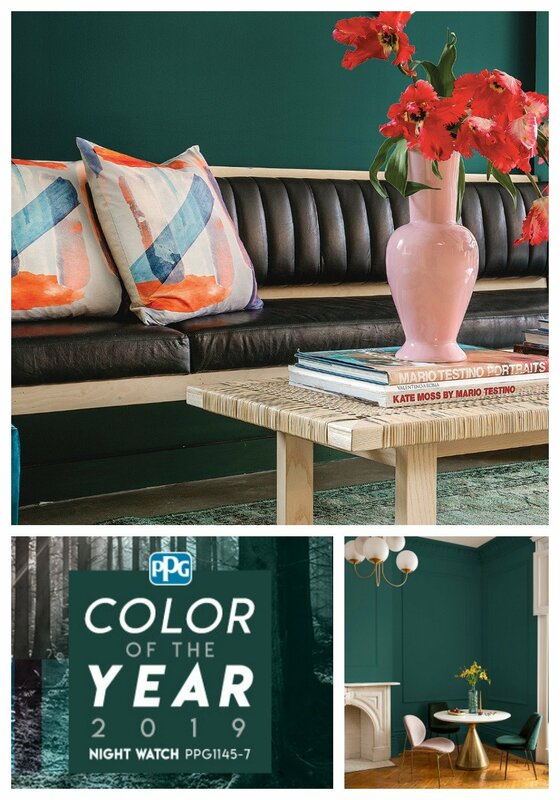 Sooo excited to see this is PPG’s 2019 Color of the Year! 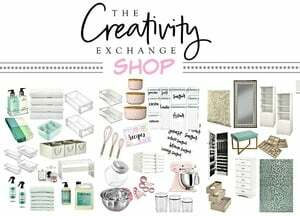 Esp because I chose it for our kitchen island in our recent kitchen remodel. I saw the color online and fell in love with it. Our perimeter cabinets are a gray stained, and I wanted the island to be different & a little bold. It’s beautiful in Night Watch, with a quartz countertop that looks like concrete.